The first and most accomplished of a distinguished family of violin makers working in Cremona, it has been thought that Francesco Rugeri was a student of Nicolò Amati. Recent research has suggested that was not the case, although the influence of Amati can certainly be seen in Rugeri’s work. He was an innovator whose most significant contribution was his experimentation with cellos of smaller dimensions than the Amati model shortly before Andrea Guarneri and two decades before Stradivari decreased the size of their cellos. These smaller Rugeri models, including this excellent example, are highly prized by professional musicians. 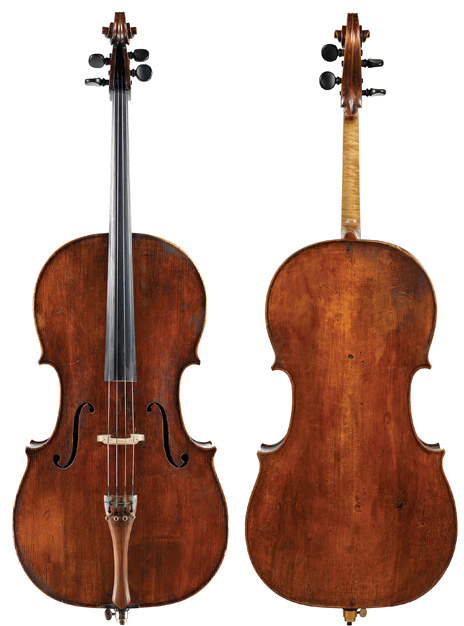 This cello is a composite with a top by the distinguished English maker George Craske (1795-1888), a talented and prolific craftsman who worked in Birmingham. Craske’s best instruments are of the highest quality, and the top he created for this instrument is superb. Tonally, the cello has the signature warmth, power, responsiveness, and unmistakable Cremonese quality of a Rugeri, but with a more comfortable price. The instrument was formerly owned by the principal cellist of a major orchestra and would be an inspired choice for any artist.